American Apparel featured this advertisement (above) on their website. American Apparel is a Los Angeles based company renowned for its USA made clothing line, inclusive stance on immigration, gay rights, its overtly sexual advertisements and its hipster customers (Sweney 2012, Rivas 2012 & Rojas 2012). Summer 2011 American Apparel released this advertisement with little hullabaloo (Rivas 2012). It wasn’t till Fahim Anwar tweeted this (right), that internet conversation got started (Anwar 2012). American Apparel’s intent was to represent an embrace of the multiethnic community within which it operates, from its growers to its consumer, and it seems that it is the gap between these two groups that has caused discontent (American Apparel 2012). American Apparel is known as a company in support of undocumented immigrants. The company has produced T-shirts with the phrase “legalize L.A.” a staple at immigration protests in Los Angeles. The company had also hired undocumented workers paying them a living wage until September 2009. After a long fight with the US Immigration and Customs Enforcement agency and threats of a raid, the company fired 1,800 undocumented workers (Salgado in Rojas 2012 & Rivas 2012). However negative interpretation, of the advertisement, in social media still persists. Writers and bloggers are particularly insulted by the use of this farmer as an accessory (Rivas 2012; Rebeldes 2012 & Rojac 2012). Colorlines writer Jorge Rivas also criticised the format for being out of sync with how American Apparel usually shoots their ads, on a plain white background in a studio. Rivas adds that maybe the inclusion of a caption about agricultural workers and how they’re paid so little that chances are they can’t even afford a plain $18 American Apparel t-shirt, would go some way to provide the advertisement with intent. American Apparel defines the two characters in the advertisement quite differently. The female is contextualized according to her hobbies and favourite foods, whilst the male through his employment (The Daily Chicana 2012). Blogger The Daily Chicana stressed that “There’s no reason why Robin isn’t the working class immigrant, maybe even one of the 40% of visa over-stayers who are Canadian, English or Australian in origin. The US like Australia suffers from the distinction between illegally preferred peoples and those who aren’t welcome. "Honestly, we're not sure what the problem is," said an American Apparel spokesperson in an e-mail. "Raul is a family friend and the photos turned out great, so we developed them into an ad and put it on our website. The whole controversy seems a bit contrived" (Wright 2012). So how would an undocumented worker portray people in a similar position? Julio Salgado, a Cal State Long Beach journalism graduate whose art has become a prominent part of the student immigrant rights movement in recent years, would portray people in a dignified light, asking them what they want to see (Kennedy 2012 & Rojas 2012). “It has to be a collaborative effort” for Salgado, “in every scenario, listening is the real revolutionary act” (Kennedy 2012). Undocumented Artist Gives American Apparel’s Farmer Ad a Political Twist (Salgado in Kennedy 2012). 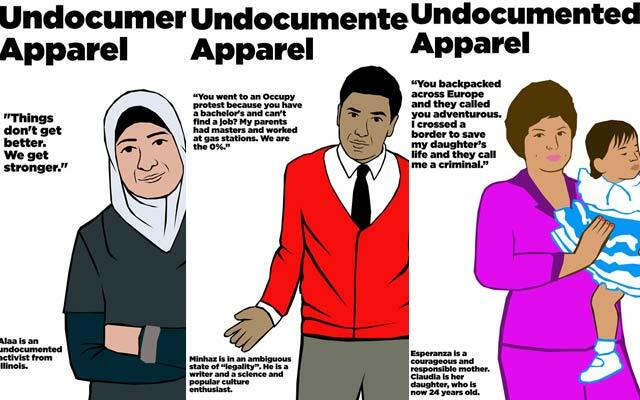 Salgado initially started the Undocumented Apparel poster as a response to American Apparel's advertisements; he felt it was in bad taste (Rojas 2012). What is American Apparel is trying to say? “There’s unity? We like you! That’s not how it happens, and American Apparel has always used people, especially women, as objects. Were they just doing this to get on the undocumented wagon?” (Kennedy 2012). Perceptions aired on the internet have started to play a big role in how controversy both can go viral, but also empower the everyday citizen to have a say – positive or negative. Salgado’s poster reply to American Apparel utilized and parodied their style of advertising – a perfect fit for one-click sharing (Kennedy 2012). People can relate to his work, however unlike advertising these are real stories that give voice to the unheard. Kennedy (2012) believes it forces people to think and engage. American Apparel isn’t the first and won’t be the last to be under-fire for this style of advertising or awareness seeking. Others have commented that a general ‘dumbing-down’ of complex issues is embarrassing (Ruge 2012). What will it really take in the internet generation for us to actually care about something when it's genuine without it being manipulated (Ruge 2012)?